The announcement which was made this morning builds on where IBM has seen significant growth in its mainframe business over the last decade. At the launch of its z13 mainframes earlier this year, IBM said 27% of its installed mainframe base was running Linux on System z. Many of those customers were new to the mainframe and included cloud companies. They were interested because they could get very high density of Linux VMs on the mainframe at a lower rate than on other hardware. 15 years ago IBM made a $1 billion investment to move Linux onto the mainframe platform. 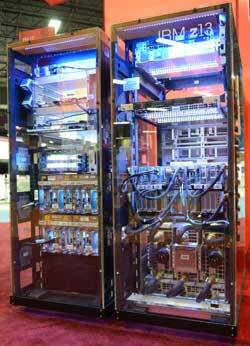 It was seen as a gamble by many analysts and the media but has underpinned a revival in the mainframe market. Linux on System z is delivering IBM net new clients, as well as new business from existing clients. These are impressive numbers, but the mainframe to many is about as far from Linux as it is possible to get, so what is IBM delivering. 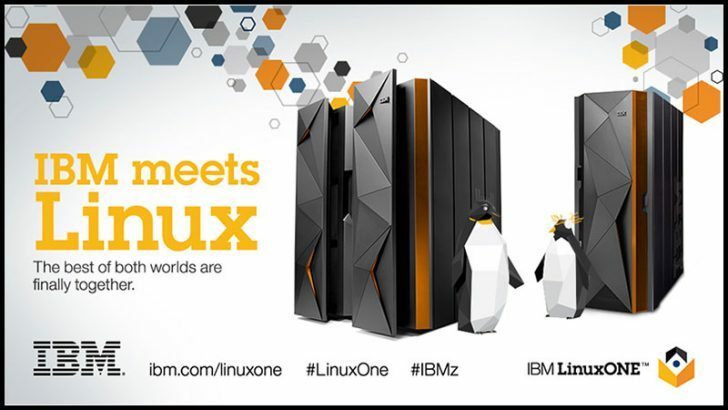 IBM has now decided the time is right for LinuxONE a family of mainframes designed just for Linux. While based on the IBM z13 mainframe platform, IBM is keen that customers should not confuse this with its existing mainframe marketing. LinuxONE is a separate brand and will be marketed as such. There are three parts to the announcement that has been made today. A massive expansion of the Linux ecosystem with IBM giving away several hundreds of thousands of lines of code to help the community get started on the mainframe. 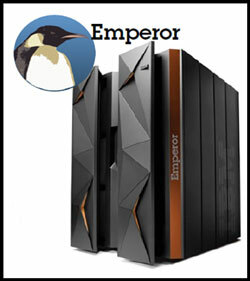 There are two models in this initial announcement, the LinuxONE Emperor and the LinuxONE Rockhopper. 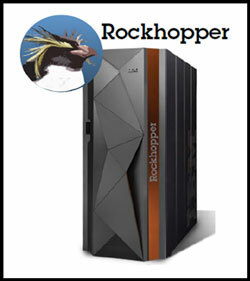 Being Linux based machines IBM has decided to name them after penguins. At the moment, little is really known about them as IBM has kept the entire announcement under strict embargo and the website showing the details is not yet available at the time of writing this piece. IBM already has a solid marketing machine around Linux on System z and will be taking all the work around its CAMSS messaging – Cloud, Analytics, Mobile, Social and Security over to the new LinuxONE brand. This means that customers already gain from a broad portfolio of solutions ready to be deployed to whichever model they choose. This is a first for the mainframe. Customers will be able to order their LinuxONE mainframe with virtually complete freedom over how they want it configured. IBM is providing multiple options for every part of the software stack from the Linux version, to the languages and the application software. What IBM is doing here is clever. It has had significant success with the bare-metal approach across its SoftLayer cloud business. It is now taking that same approach with LinuxONE and telling customers that they can have it bare-metal, bare-metal with containers or fully virtualised. This is not just a message for the cloud market although those customers who have already committed to building their cloud infrastructure using Linux on System z will be ecstatic that IBM is delivering a solution ideal for them. The enterprise will also like this message. Large enterprises that are buying mainframes and being prepared to commit to the technology want flexibility. This has been part of IBM’s core messaging to the mainframe market over the last five years as it has shed the old mentality of the mainframe and instead transitioned to something which is just another hardware box. This ability to choose from a range of different products from Linux distribution right up to database and analytic tools is exactly what customers expect from other IBM Linux platforms. To achieve this, IBM has had to persuade the different Linux vendors that LinuxONE is a brand they want to support. This is not just about options for buyers. OpenStack means that operations teams they can manage LinuxONE in the same way they manage their other cloud environments. Support for Chef and Puppet delivers an integrated DevOps environment that will appeal to a lot of IBM’s existing mainframe customers who are already running Linux on System z as well as other platforms in order to get a single DevOps experience. IBM has also extended support for Docker and containers to LinuxONE. This is a very interesting move as it delivers on IBM’s marketing message of moving the apps to the data not the data to the apps. To handle that data, there is support for IBM DB2BLU in-memory database as well as open source products such as Hadoop and Spark. Including Spark means that IBM is delivering on part of its announcement a few months ago and enables it to deliver support for more complex environments than HP and Huawei who have also made big Spark announcements. At the launch of z13, IBM talked about cloud providers who were buying mainframes to deliver hybrid cloud opportunities for mainframe customers. This is not about customers bursting into one or two cloud instances but customers who will have reserved hundreds and even thousands of cloud VMs. With LinuxONE IBM is promising to make the hybrid cloud a smoother path for customers. There is still a lot of issues over data management and bandwidth but this will appeal to its customers. IBM has been rolling out a range of flexible pricing options for the mainframe for over a year. Changes to its Multiplex and Sysplex pricing models enabled customers to move workloads across multiple System z mainframes and treat them as if they were a single machine. This was necessary to deliver the “move their workloads to the data” message and prevent customers having to licence all workloads on every mainframe that they had. It also introduced a range of usage programmes that allowed customers to exceed the capacity they had paid for and aggregate additional usage over a period of time. This was designed to prevent customers worrying about price increases impacting their ability to manage surges in workloads. Pay for use model: A customer agrees a fixed monthly charge but only pay for what they use. If they have a low processing month then costs will fall. If they have a sudden surge in processing due to a change in their business model then prices will increase. Per-core pricing model: This allows customers to designate which core a software licence will run on. If they need to increase the number of cores then it can be done immediately. Decreasing or even cancelling the per-core licence will still require a 30-day notice period. Rental model: This is an interesting option as there is no up-front payment required. Customers are effectively leasing rather than renting as there is a 36-month term on the deal. IBM retains the hardware and customers get the standard leasing buy, return or replace option at the end of the contract. What is different to other models is that the customer is only locked in for 12 months. At that point they can cancel the contract and return the hardware. There is no question that IBM is keen to differentiate LinuxONE from other hardware platforms such as Intel and even its own POWER systems. The utilisation rate is perhaps the biggest of these as other systems are unable to match the 90% utilisation rate the mainframe has delivered for decades. The mainframe has always claimed a high security play and IBM is determined to take advantage of this with LinuxONE. It is quick to point to the cryptographic capabilities of the z13 mainframes and all of those abilities will be available to LinuxONE. This includes plug-in boards that will ensure that data is always secure not just when at rest but when in transit to and from the LinuxONE mainframe. Reliability is a key part of this message and unsurprisingly there are a lot of claims coming out of IBM such as ‘zero visible memory failures in the last 5 years’ and ‘designed for 100% uptime’. At mainframe events IBM often rolls out customers such as American Express who talk about zero mainframe downtime in decades. The Open Mainframe Project: The Linux Foundation is to announce as part of its collaborative project structure the Open Mainframe Project. It will include IBM and at least 9 other vendors including CA and BMC as founding members who are financially committing to the project. The intention is to deliver enterprise-grade Linux software for the mainframe and dramatically expand the pool of available applications. IBM appears very bullish about this and has said that this is not just about vendors but will also include educational institutes, customers and companies in the distribution channel who already use Linux on System z. It is promising a range of internships, hackathons and joint development. It already has its own academic initiatives such as the Master the Mainframe competition which currently pulls together several thousand entries per year from around the globe. It will be hoping that the Open Mainframe Project will swell the number of those involved by appealing to a wide section of the open source community who have previously ignored Linux on System z. Open Access to LinuxONE Community Cloud: From today, IBM is making it easier for ISVs to get access to LinuxONE through their PartnerWorld accounts. There will be three locations where the LinuxONE Community Cloud is hosted, Dallas, Boeblingen and Beijing and partners will be able to port, test and benchmark their applications at any of these three cloud locations. Clients will also have access from Monday to a set of free environments to try before buy. This is only a limited time offer and it will be interesting to see if IBM extends this to help customers test software and get themselves ready for LinuxONE. Later in the year some of the education institutes working with IBM will create their own student version of the LinuxONE Community Cloud. Access will be through IBM DeveloperWorks enabling not just students but any developer or small company to access Linux VMs on LinuxONE. Open Source Community Contributions: This is where it gets very exciting. IBM has made a massive code contribution to the open source community. While it currently refuses to talk about how much code it is giving away, it is believed to be several hundreds of thousand lines of code. As part of this IBM has announced that it will make universal access to some of its IP. Today it is announcing that zAware will be the first product to be open sourced. This is a surprise move by IBM and has caught many people off guard. It is about targeting the existing customer base who are not only using Linux on System z but are also very big users of Linux VMs. IBM is looking to give them an easier route into the mainframe and continue the growth of this business. The growth of its ISV market around System z will no doubt have factored significantly into its decision here. It will be extremely interesting to see just how quickly the open source community starts to engage with IBM and the Open Mainframe Project. IBM has been working on bringing its own software across to Linux on System z but has only ported other Linux software based on customer demand. It is now making it easier for open source projects to do their own porting to the platform and areas where this will initially play are expected to be DevOps, Big Data and Analytics. This is definitely _not_ the first Linux only mainframe from IBM. When the z800 was announced the first model offered was for Linux only. Interesting. I don’t remember the z800 and it is interesting that the IBM press and analyst team have been at pains for the last week to insist that this is the first mainframe designed only for Linux. Yeah, well, it’s all about marketing. For some time now, IBM has been trying to acquire new “first in enterprise” customers. I.e., customers that don’t have a mainframe. A number of those have been Linux only, Linux and z/VM only, with the rest being a mixture of z/OS, Linux, etc. Even so, the z13 was _not_ designed solely for Linux. No IBM mainframe ever has been, or ever will be. IBM has always taken the approach that their mainframes are intended to be used for a wide variety of workloads. This is, in part, why they don’t get into the “my benchmark numbers are better than yours” game. The machine is intended to be good for a lot things, not the best at only one or two. And a lot of the benefits of the mainframe can never be measured by any sort of benchmark.